When we arrived to Olshani, Yaacov-Hirsh and Leibl departed from the parents and the sisters. Yaacov-Hirsh, about 22, is going to Vilna, which is under German occupation. He is working as the secretary of the "Tarbut" Hebrew Jewish Secondary School, named after Epstein. Epstein was a physician who established the school. After Dr. Epstein's death, the school had budget difficulties. At that time, the German are advertising on large bulletin boards all over Vilna, that they have interesting, well paying jobs for available intellectuals. Yaacov-Hirsh goes there for an interview and shows his passport. When they see that he is a "Russian Soldier", they immediately confiscate his clothing and watch, and take him as a POW. He is being sent to Elsas-Lothringia (in Germany, near the French border) to work in the mines. Later he worked in an oil factory, and finally in the kitchen. He was 17 during the war, not yet at the age of mandatory draft. 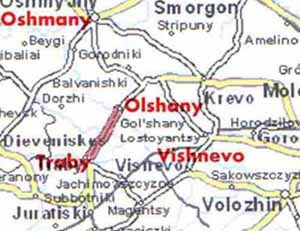 He went from Olshani to Oshmene, where we had relatives of my father's side. Oshmene, too, was under German occupation. The Germans captured him and put him in "Panni Battalion" as they did to everybody else. He suffered hunger, hard labor, and beatings for two years, till he succeeded in getting released.